All too often, we see businesses giving up on inbound marketing prematurely. Many grow frustrated with a lack of ROI after a few weeks and pull the plug. Let's get something straight, inbound marketing is not the get rich quick scheme of the marketing world. It takes consistent effort over several months before a significant ROI can be seen. It all comes down to mindset - inbound takes a significant but manageable time commitment, but the rewards are considerable. Studies clearly show that the more you put in, the more you get out of it. Doing inbound marketing right takes several hours every week, and you probably won’t see decent returns for several months. Our advice is that you keep plugging away at it - smartly, of course. Inbound marketing thought leader Ann Handley recommends that even the smallest businesses devote 15 minutes per weekday to inbound marketing. According to Handley, we should all, at the very least, spend some time every day joining existing conversations, curating content and showing a personal side to the business. But let’s be honest - if you want significant business results, you need to invest a bit more time and/or money in a consistent manner. So how much is enough? A solid inbound marketing campaign will have you spending 5 to 20 hours a week on creating and curating content. If you just want to test the waters and rarely publish original content, one to two hours per day is decent, but it will limit your results. On the other end of the spectrum, an experienced marketer working 4-5 hours every weekday on inbound marketing will likely see larger results much faster. Spend that time blogging, publishing ebooks, curating content and engaging on social media. A blog that represents your brand and is interesting to read will help drive traffic, build your audience, establish your authority and turn your occasional customers into loyal fans. Extensive participation in trending conversations happening on social media will create an emotional bond between prospects and your business. Showing the personal side of your brand makes it more likely buyers will choose you over the competition. Don’t expect results within too short a period of time. Even with a significant investment in marketing, you will likely have to wait months or even a year until you see a major upswing in traffic, leads and sales. The data shows that companies which publish new blog content once a week and generates content slowly can double its website traffic in 24 months. But a company that pushes out content more aggressively can expect much greater results. Of course, if you’re starting out with a high baseline, with thousands of visiters daily, then growth is likely to be less dramatic and rapid. And every situation is different - what works for one brand doesn’t necessarily work for all. 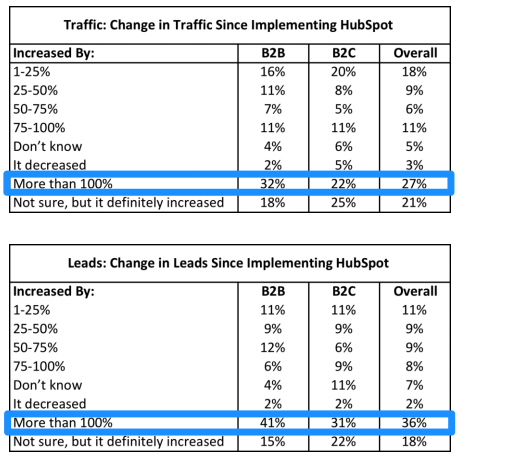 A 2013 study (pdf file available here) from MIT MBA student Annie Hung tracked the extent to which using HubSpot’s tools enabled businesses to increase traffic and sales lead volume. Her results say it all. As you can see, the highest share of results across company types went to doubling the yield! In order to be effective, inbound marketing takes hours and months. It’s a marathon, not a sprint. If you are willing to put in the time consistently over a long period, you will see awesome results. There aren’t any true shortcuts, but this type of commitment isn’t for everybody, so if faster results are important to you, you might want to consider hiring an expert service provider. If you adopt inbound with a marathon runner's mindset, you'll find victory at the finish. Your SEO will improve, so more potential customers will find you through search. Your audience and customer base will grow, allowing you to market to more people with email. Word-of-mouth referrals will start coming in. You’ll get more website traffic and ultimately more sales. Just don't stop short of the finish line.